To begin with, players form 5-character parties using characters they raised in the main campaign. Map – Choose battle map (choice of 6 maps or select map at random). Time Limit – Set time limit for each Turn from 3-10 minutes (Note: If you exceed the time limit, you forfeit your Turn.). Players take turns moving their units on the multiplayer-exclusive battle maps. 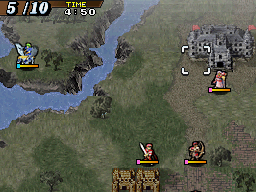 On each battle map, there is a castle situated at the very centre- if an unit waits on the castle gate, the castle flag changes colour to their team’s colour. You win the match by either having the castle flag be your team’s colour once all the Turns are over, or by annihilating the opposing team. Certain items cannot be used, including the Geosphere, Aum staff and Master Seal.